I'd stick with premium gas, especially since these cars are so sensitive and repairs are so costly. With regular or mid-grade, the engine will not run as well or get the optimal gas mileage. If you payed for a BMW and its maintenance, you could probably afford premium 91 gas. If you open the gas tank door, it should say which gas to use or which is recommended. I had always stuck with the suggested gas type with my Jaguar and I never had any major engine problems that could have resulted from the wrong fuel type. I went through several water pumps though. BMW engines are high performance engines that required high compression capable gas. The extra money we spent on premium gas is for its ability to handle the high compression requirement. Lower grade gas may ignite prematurely and resulted in 'knocking'. With that said, my daughter accidently filled it with lower octane gas (85 octane) in my 2003 330i, and it ran fine without issue for a week. I switched back to premium gas soon after. IMHO, the fuel cost saving between premium and regular does not justify potential engine damage and repair cost. Keep in mind that altitude affects the octane number for premium gas. A premium gas in Denver (mile high) is 91 Octane, and it is lower at San Francisco at sea level. 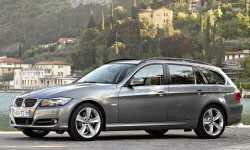 While your 2011 BMW 328i will run on regular (87 or 89 octane) you will notice decreased performance and gas mileage. The knock sensors in the engine computer will accomodate the reduced octane, but as one of the other posters noted, even the four cyclinder BMW engines are complex high compression high performance engines. If you put regular in it I would fill up with premium at the next opportunity. I always use premium, but I don't put many miles on my car, so the price difference is not a big deal. I've owned a string of BMW's going back to 1998, and including a 2011 328i. I have experimented numerous time with using a tank of mid grade and comparing to results to a tank of premium. There's no problem for the engine; today's computers are smart enough to adjust the timing so there is no pinging or any other symptom except that performance does fall off slightly. You'll only notice that if you look for it though so it's really no issue. However, what I found interesting is that my gas mileage falls off noticeably with the mid grade fuel, and it falls off enough that the cost -per mile driven- on a tank of gas comes out the same or slightly higher on mid grade as it does on premium. That is: yes the mid grade costs less per gallon, but the number of miles per gallon received per gallon falls off enough that it's no cheaper to operate the car. After playing with it two or three times, I decided to just buy the premium gas. It doesn't cost me any more in the end, and I do get slightly better performance. Big help...................Thanks to all ! 91 octane is the highest you can get in CA and San Francisco unless you go to a racetrack or something. 85 is the lowest octane you can get as far as I know mainly in Colorado or high altitude areas. Premium in Colorado is 91 like California. Never been to Denver or Colorado, just researched it. If I fill at costco I get lower milleage from same tankfull than if I fill at another station. I noticed difference between major brands also. Something else to consider, I noticed that much difference only with my 2011 328xi, my 1997 Z3 with 1.9liter 4 cylinders seem really happy with both although it is an high compression engine as well. Most likely the 1997 engine is less sophisticated than the 2011? When I am data logging the vehicle's ecu for tuning purposes my wife will use her grocery store fuel perks (Giant Eagle based out of Pittsburgh) and will see the engine being more knock sensitive. So I'll tune the car around the no Top Tier gasoline. I've read every article I could find over the years on octane and what is necessary. All new(er) cars have knock sensors and the computer (ECU) will adjust to the octane to prevent pinging (pre-detonation) which prevents engine damage. The only time you'll have a problem is if a knock sensor goes bad and you'll both hear the pinging and feel the drop in performance. In that case, be SURE to run the highest octane possible until the sensor is replaced. However, when everything is working correctly, you won't damage your engine with lower octane, but you may also suffer a performance hit and lower fuel economy. As a couple of the previous answers explain, you sometimes don't save money buying the less expensive gas, but I'd recommend using "Top Tier" fuel because the studies show the fuel system stays much cleaner. All the major brands (ex. Valero, Exxon, Shell, BP, etc.) are Top Tier and QT is the only convenience store brand in my area that is rated Top Tier. We've tried Regular, Mid-grade, and Premium (10% ethonal) in my son's '04 325i (E46/M54) and settled on mid-grade. We didn't see any significant improvement in fuel economy or performance with premium, but we did see a drop-off when running regular. I'm sure every different series of engine performs a little differently. A drop in tire pressures or a 25-35? F temperature swing will have more of an effect on fuel economy than does the grade of fuel these days.